The first Outlast game was a gem for survival horror fans with overwhelmingly positive reception. Red Barrels’ Outlast 2 (2017) doesn’t stray far from its already successful formula. You play as investigative journalist and everyday man Blake Langermann, who somehow is always low on camera batteries. Stuck in the middle of the woods due to a helicopter crash, Blake is commissioned with having to locate his missing wife while battling a deranged bloodthirsty cult without weapons, building the tension through each scene as you feel helpless peering through the lens of your night-vision camera. This game is true deep South horror, immersing you into the fear of being trapped in a nightmare of religious rites and holy sacrifices surrounded by forest, corn fields, and abandoned shacks. Think less Texas Chainsaw Massacre (1974) and Resident Evil 7 (2017) and more Stephen King’s Children of the Corn (1984). Outlast 2 was banned in Australia for a short duration while the Australian ratings board refused a rating system for the game until developer Red Barrels revised its original submission. The board made its decision based off of “implied sexual violence” and ultimately decided to give the game an R18+ rating, one step below an X-rating. Just like Outlast, Outlast 2 knows how to deliver on a creepy atmosphere. The developers intended to build on the original game, naming it Outlast 2 on purpose. The game is supposed to feel like a continuation of the game within the same universe, much how True Detective Season 2 (2015) was supposed to (shudder) feel like it was taking place within the realm of the original True Detective (2014). Where True Detective Season 2 failed, Outlast 2 succeeds. The game is more open than the first game, and less linear than the first game, leaving for eerie moments as you push through corn stalks and find clever objects to hide in, behind, or under to avoid enemies. And surprisingly, not every enemy is trying to kill you (WHAT?!) which makes for horrific trial-and-error experiences as you pass by. The corn fields make for a very interesting part of the game, pushing you further into disorientation as you try to escape enemies and disappear deeper into the corn fields. 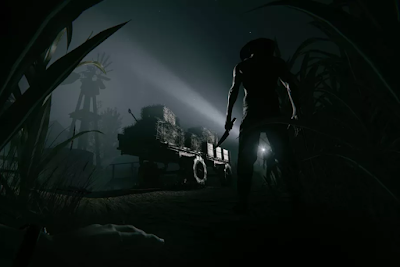 You feel helpless against enemies and lost because you can’t fight enemies without weapons, so you find yourself frantically running from hiding spot to dark building, sinking deeper into the corn fields until you are more lost and more disoriented, frightening you even more as you remember there are enemies chasing after you. This is what horror games like Outlast 2 do right. While you are playing Outlast 2, you panic because you are lost and you are lost because you panic. The game does have a few places where the game does wear thin. Much of what worked in the original game was based off the shorter format of the original. 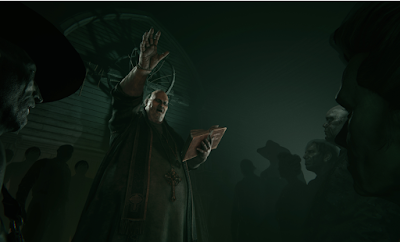 In Outlast 2 the story drags for a longer duration making the gameplay repetitive and filled with plot holes that you forgave in the original game. For example, having no weapons in a mental asylum made sense, but having no weapons while wandering through a farmhouse filled with rakes and enemies carrying sickles now is seemingly less believable. Throughout the game, Blake has flashbacks of his childhood which will trigger anyone that has ever attended a Catholic school, As there is no beginning, middle, or end to the storyline of this game, so you must rely on finding clues through journal entries and objects that you come across and hallucinations. The flashbacks of Blake’s past only adds to the horrific events that are currently unfolding in your life. The flashbacks are even more upsetting because it brings anxieties up that you weren’t even aware that you needed therapy for. While the mechanics of the game are close to the original game, the depth of the characters and cult is what really intrigues horror lovers. Often unsettling at times, Red Barrels did a great job at developing the cult characters in this game. One room you enter has five coffins full of five dead little children and a mother in the corner holding a dead infant singing about her children going to heaven. Outlast 2 simply does not hold back on dredging up unpleasant imagery, sending you into a PTSD ridden hell when you are done playing the game. You will be thinking about this game for weeks after you finish.